Vintage 1982 Ferrari press release on the Grand Prix of Belgium held at Zolder. 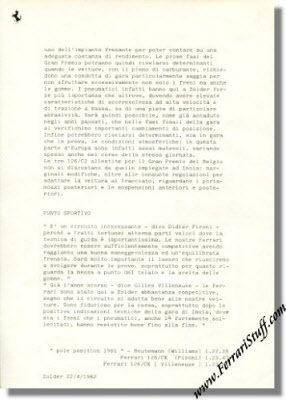 This is a rather sad document that Ferrari issued prior to the Belgium Grand Prix in which Gilles Villeneuve would so sadly perish in qualifying at the wheel of his Ferrari 126. 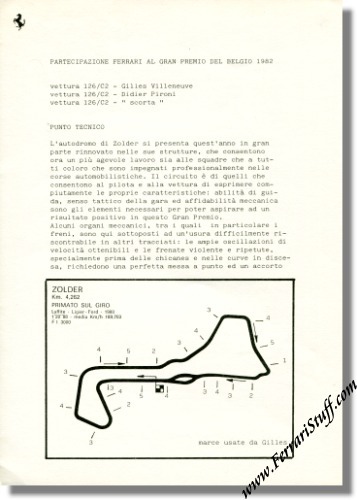 This rather simple, but highly original, document was issued to the press and informs about Ferrari's view of this race, which cars they brought (including a 126/C2 "scorta" or "t-car") and a map of the track including Gilles' shifting points. Of course, it also mentions Didier Pironi. This is the only one we have ever had of this particular race and we are inviting serious offers on it through THIS LINK. Only 1 available in Italian language.